Engage your key buyers with dynamic calendars. Rose Calendars are proud to offer over a century of experience in designing, publishing and printing promotional calendars. 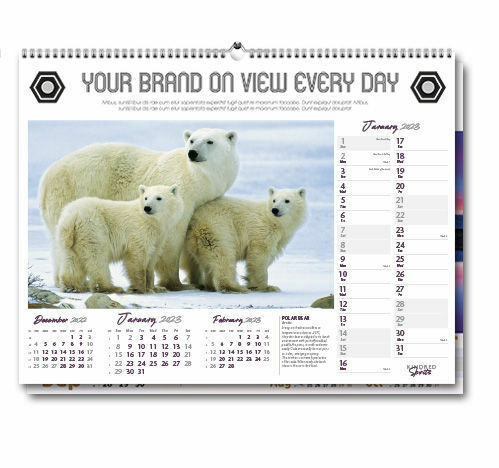 Proven to be one of the most cost-effective forms of advertising and providing a medium for your business promotion, our extensive range of stunning advertising calendars ensure your brand is directly in front of your customers all year round. Whether you are looking for attractive, eye-catching promotional wall calendars or stylish branded desktop calendars, our range of 2020 calendars includes stunning titles and formats for every taste and budget. Please browse our range of exciting promotional advertising calendars for 2020. Over A Century Of Calendar Design, Manufacturing & Printing! Your calendar printing requirements are in good hands at Rose Calendars: we have been designing and publishing promotional calendars for over 100 years and through our expertise have become the leading calendar printer in the UK. The exceptional quality of our calendars and high standards of our customer service, coupled with low minimum order quantities and fast and reliable delivery, is renowned in the world of corporate calendars. Our 2020 calendar range features innovative designs coupled with easy-to-use date pads, with stunning imagery complemented by informative captions and additional useful information. The 2020 range also features our innovative, industry leading 360interactive Wall Calendar. You can see all our new titles here. Make the most of your 2019 marketing budget by investing in promotional calendars from Rose Calendars, specialists in corporate calendars for over a century! 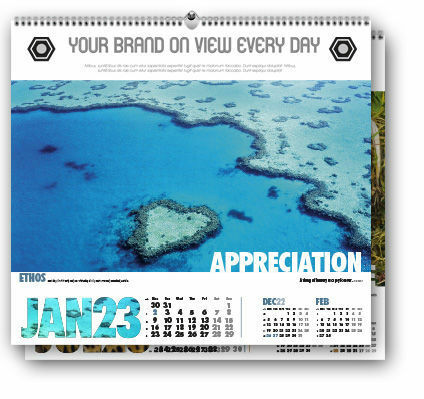 Some of our most popular advertising calendars this year. "Our long-established yet evolving family business uses promotional calendars to ensure our brand is kept in front of our suppliers and customers every day. Quality is the name of our game and calendars have an important role to play." "Calendar advertising works for us as it reaches customers every day of the year. We like working with Rose Calendars as they take environmental responsibility at the same time as producing our calendars." Discover the history of significant dates from around the world, and keep up to date with what's happening at Rose Calendars. From a Florentine explosion and Norwegian crime novels, to giant omelettes or baby bilbys, find some more unusual and eccesentric Easter traditions as we take a look at what happens at Easter time around the world. Shrove Tuesday - it's not just all about the Pancakes! 5th March is Pancake Day or Shrove Tuesday. People will enjoy a final fling before the forty days of Lent begin, celebrating with traditions as diverse as pancake tossing, skipping, crazy ball games and exotic carnivals. Crowds of revelers will flock to carnivals in Rio, New Orleans, Venice and a host of other cities, joining in the fun with music, dancing, colourful costumes and parades. Why is Christmas Day on 25 December? On 25 December more than a third of the world's population will celebrate Christmas Day. But this is not the only date on which the birth of Christ is remembered. In many eastern countries people will celebrate Christmas on 7 January, while in Armenia the date will be 6 January. So why do we celebrate on 25 December and what are the reasons for the different dates for Christmas?